We are pleased to announce that Grandma Nancy's Homestyle Pickles are now available at www.PickleAddicts.com. 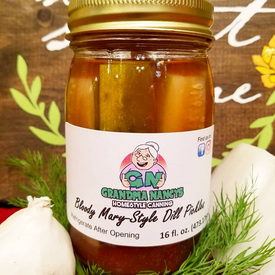 Grandma Nancy's Homestyle Canning is a family owned and community oriented company based out of Green Bay, Wisconsin. They are locally famous for their delicious handmade, preservative free products - including their specialty Bloody Mary flavor dill pickles! !